Tsking a greenhouse professional to choose 15 or so favorite plants is like asking a mother to choose her favorite children – even if she could, she shouldn’t. So instead, we asked “What’s new and what’s tried and true?” The following is a short list of dependable and delightful favorites, most of them new introductions. For each one named, however, there are scores more we could add to the list. The calibrachoa, also called million bells, is playing a major role in garden centers this year, thanks to a wide array of bright colors, including three new hybrids by Proven Winners (PW): Superbells Cherry Star, a mass of bright cherry pink flowers with a yellow star pattern (pictured at top of page); Sweet Tart, soft pink with a lemon yellow eye; and White Russian, with antique white petals and dark chocolate centers and veins. 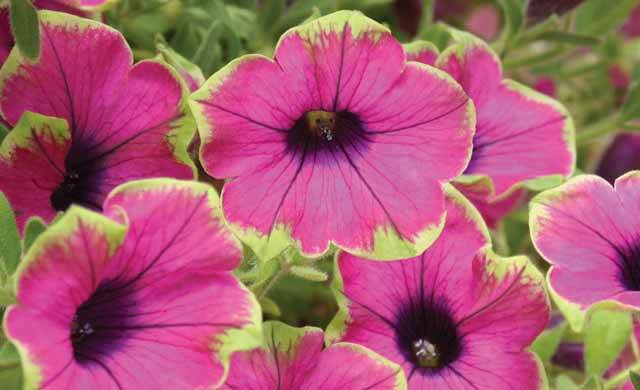 Although it’s technically not in the petunia family, PW describes Superbells as looking “like a tiny petunia on steroids,” says Chris Williams, head grower at K & W Greenery, 1328 Hwy. 14, in Janesville, Wis. Superbells have a mounding habit that makes them a wonderful choice for baskets and pots. There’s probably a form of million bells in any color you can think of, and when well-fertilized, this sun-loving plant blooms until frost. Even the steadfast petunia has received a makeover from growers recently, with introductions like green-edged pink beauty Pretty Much Picasso and Rhythm & Blues, a rich blue beauty with white edges. It’s hard not to love the many forms of impatiens, especially when planting in shady spots. They come in many colors and bloom all season long. New in 2012 is Rockapulco Coral Reef, a double impatien. Another favorite of greenhouse professionals is lobelia, with its tiny flowers in true blues, whites or lavenders. In forms upright or trailing, this sun-lover can hold its own in a bed or border but is often seen in red-white-and-blue or other color-themed containers at the garden center. A perennial in some parts of the world, we classify it as annual in these parts. Along the same line is bacopa, a snowy white, tiny-flowered plant with a layered trailing growth habit that makes everything around it look prettier, much as baby’s breath does in a corsage. “We use tons of bacopa in our containers, because it just keeps blooming and looks beautiful,” says Hagemann at Merlin’s. Finally, in our list of annuals, a word about the beloved, no-longer-humble sweet potato vine; this plant has risen to star status because of its easy-grow beauty, vigor and ability to make any container or bed look lush. These days it comes in many colors, from its signature lime green to shades of bronze, purple and rust. But sometimes you can have too much of a good thing. “I love this vine, but I recommend getting the non-vigorous varieties if you’re using it in containers or hanging baskets,” says Gensler. “The Sweet Caroline and Sweet Georgia series are non-vigorous and won’t take over a container.” New in 2012 is PW’s Illusion Garnet Lace, with an elegant cut leaf form, very dense branching and garnet red shading. While annuals provide instant color gratification, perennials return to us every year like old friends. One that growers have had a lot of fun with recently is the coneflower. In its simple lavender form, this plant symbolizes the Midwestern prairie. But today’s hybrids come in outrageously bright colors, like the magenta, pink, yellow and orange-red colors in the PW Big Sky series. This year comes Firebird, Flame Thrower and Secret Joy. A reddish-orange beauty, Firebird has large blooms with unique petals that tilt downward. Flame Thrower has two-toned orange and gold flowers. “It can reach 40 inches tall, and has a well-branched, free flowering clump,” says Williams. Secret Joy blooms all summer long with pale yellow, fragrant flowers. In some ways, coral bells (heuchera) and foamy bells (heucherella), are to perennials what sweet potato vine is to annuals. 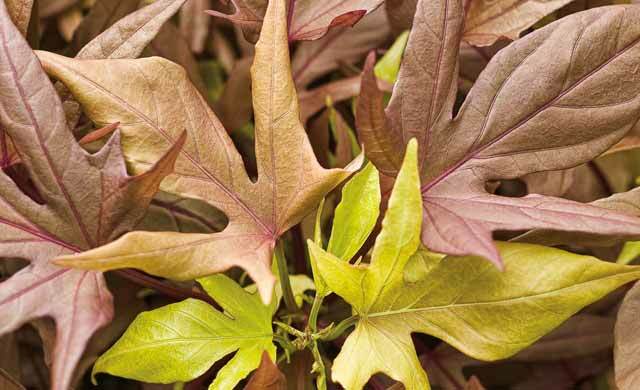 Known more for their lush foliage than flowers, growers now offer a wide range of colors from coppery peach to many shades of bronze, purple and green. Sunrise Falls is bright lime with dabs of magenta. There are several 2012 daylily introductions, including Exotic Candy, which has light pink flowers with dark rose eye zones. It blooms mid-summer and re-blooms. 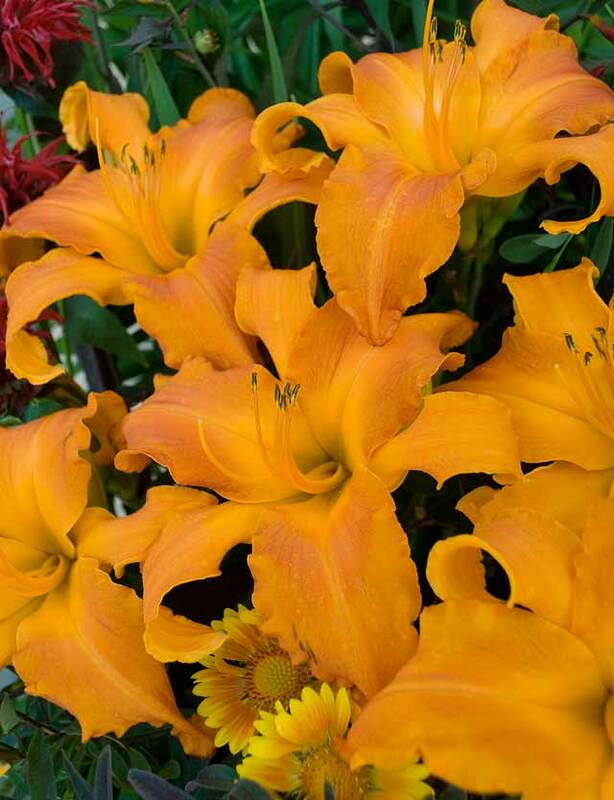 Jazz King is a big, sturdy golden-orange flower with thick petals and a raspberry eye. “It’s fast-growing and has ruffled edges, but it’s not a re-bloomer,” says Williams. Primal Scream is a flower that demands attention in the garden. It has large tangerine flowers with narrow, twisted petals. Also new in 2012 are some pretty new forms of coreopsis, including Cherry Lemonade, with deep cherry-colored blossoms nestled into thready, bright yellow foliage. There’s also a new dark-foliage sedum with striking raspberry-colored heads, and a lovely pink columbine called Pagoda Rose, featuring a cream colored center. Columbines are always a big hit with hummingbirds. A very special helleborus was recently introduced, another in the Winter Jewels line, called Rose Quartz. Touted as the first double helleborus to have every white petal edged in rose, this beauty becomes available this fall. Container gardening is manageable and rewarding. While there are few rules, local gardening professionals offer tips for success. “Be creative and have fun,” says Dee Speaker, greenhouse manager at K & W Greenery, 1328 Hwy. 14 East, Janesville, Wis. “I like a palette of hot, bright colors, maybe hot pink or orange with lime green, with about three or four plant varieties. But we make beautiful containers with all-pastel colors, too, or many shades of the same color, like variations of purples and lavenders.” One of her favorite sun container “recipes” involves bright, lime-green sweet potato vine for a trailing element, a few vibrant calibrachoa or Supertunias, and a taller plant like angelonia, Persian shield or a whimsical grass like King Tut or Fireworks. Don’t forget about your fluttering visitors. Some other flutter-friendly annuals: ageratum, begonia, geranium, globe amaranth, flowering tobacco, fuchsia, petunia, nasturtium, snapdragon and verbena. The container itself can be a striking addition to your color or style theme, but always make sure it’s large enough and offers adequate drainage. If you’re planting or buying a hanging basket, think hard about where it will be placed. Sun-hungry plants won’t bloom well in shade and shade plants may scorch in full sun. Also consider how well you’ll be able to enjoy the plant in that location. It’s not unusual to buy a beautiful hanging basket one day, only to wake up the next and find it drooping like cooked spinach. 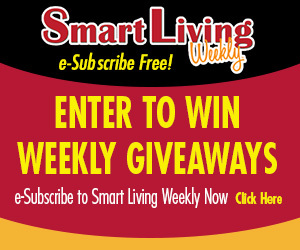 This entry was posted on Thursday, May 24th, 2012 at 12:00 pm	and is filed under Home & Garden, Top Posts. You can follow any responses to this entry through the RSS 2.0 feed. Both comments and pings are currently closed.